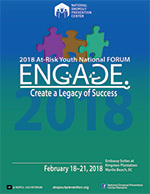 The National Dropout Prevention Center/Network would like to invite you to the 2018 At-Risk Youth National FORUM, February 18-21, 2018, in Myrtle Beach, SC. The conference theme is ENGAGE: Create a Legacy of Success. We are excited to announce our three Keynote Speakers: Mr. Frank DeAngelis, retired principal at Columbine High School; Mr. Roy Juarez, motivational speaker “Homeless By Choice” Tour; and Ms. Tierica Berry, motivational speaker, author, and spoken word artist. These keynote speakers, along with over 75 breakout sessions, will focus on strategies for homeless youth, mentoring relationships, and family and youth engagement. 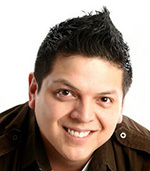 Roy Juarez Jr. founded America’s Business Leaders – a human development company in 2005 when he was just a freshman at Hardin-Simmons University. With a dream to inspire youth and reunite families Juarez began sharing his turbulent history to touch the lives of youth, educators, and parents. As a young entrepreneur, Juarez has been able to develop a successful career lecturing to thousands, both nationally and internationally. 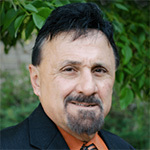 Once a homeless teenager, Juarez fought the battle to leave the streets only to return to them after becoming a graduate of Hardin-Simmons University. Juarez’s story and work has gained national attention on outlets such as CNN and Chicken Soup for the Soul. In addition, it has been captured by many local and online publications. Juarez just launched his 2nd National Tour (IMPACT TOUR). His first tour, The Homeless by Choice Tour was a huge success. In May 2012 he completed his first tour after reaching over 100,000 individuals with his personal message of hope, perseverance, and the power of a higher education. Born and raised on the south side of San Antonio, TX, Juarez faced situations and obstacles that could have turned him into a negative statistic but he found a way to overcome those challenges. At the age of fourteen, Juarez was a high school drop-out and one of the hundreds of homeless youth on the streets of San Antonio. He carried with him only a duffle bag of personal items that he called a home. He moved from house to house to survive. Despite all that was working against him, he knew there was more to life which is why he never lost sight of his dreams! Juarez serves as a role model for thousands of individuals through his work as an advocate for youth and higher education. His life experience inspires them to forgive, chase their dreams, and be the change they wish to see! 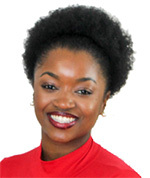 Tierica Berry is the founder of A Woman’s Standard, an organization geared toward helping young women set and achieve higher standards in various areas of their lives including but not limited to education, career, self care, finance. As an emotional success strategist and women’s empowerment leader and she spends most of her time delivering staff development training and youth presentations. With heavy emphasis on emotional success Tierica has managed to motivate and redirect some of the most troubled youth with her engaging and relevant programs. In partnership with Hustle University and the Make a Way Program her organization services various types of youth organizations from public school districts to youth detention centers. Tierica has received national recognition for her creative writing program, The Anthology Project, and her latest initiative Unpacking the Emotional Suitcase. As a published author of multiple empowerment books Tierica is determined to make a tremendous impact and leave a lasting legacy. This strand focuses on the unique needs of homeless youth. Presentations will present effective strategies for meeting the needs and engaging with homeless youth and their families. Priority will be given to presentations that highlight programs with high indicators of effectiveness. This strand will focus on strategies and programs that have proven effective in reaching or affecting youth who are currently or potentially involved with the juvenile justice system. Presentations in this strand can include preventive and restorative programs affecting this key population. 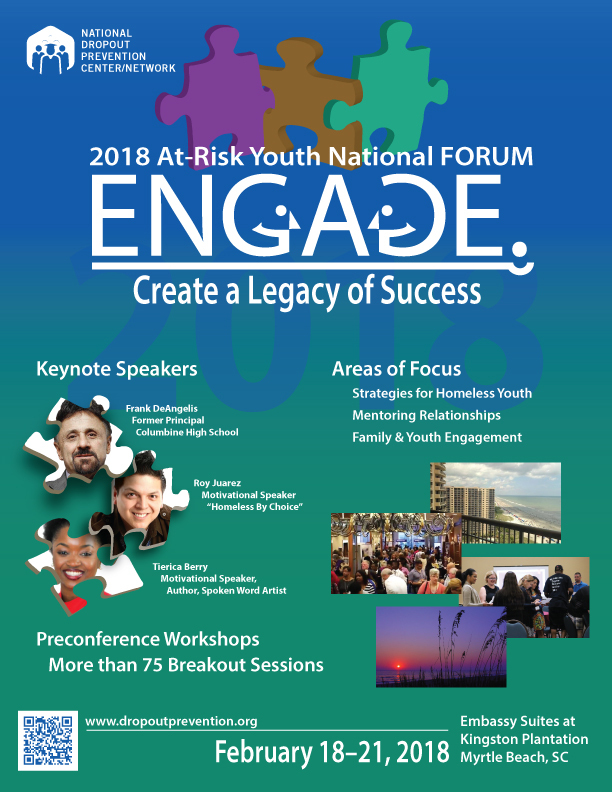 This strand will focus on strategies and methods that encourage engagement and relationships with at-risk youth, family members, and business and community members. These strategies may include specific programs that may be transferable to other contexts, relationship building and interpersonal communication strategies, and strategies to build or engage community members or organizations as partners. This strand is geared to present ideas and practices that address the teaching and learning needs of specific populations of students. Students with disabilities; incarcerated youth; English language learners; new immigrants; students living in poverty; the homeless; students from urban, suburban, and rural areas; different religions; and sexual orientation are but some examples of groups whose learning needs must be successfully addressed in order to foster conditions to prevent dropping out of school. This strand’s focus is on teaching methods that lead to greater student engagement. While specific subject matter presentations are welcome, they should address the connections that keep students engaged and in school. For example, the connection with an individual teacher, a subject or track of classes, or a vocation may keep a student in school. The connection may be strengthened through a teaching method or style. Presentations in this strand will focus on programs and strategies that have been demonstrated effective in the development of skills that equip students with adaptive and positive behavior that enable them to deal effectively with the demands and challenges of everyday life. This strand looks at the strategies and resources available to building-level administrators and staff, whose efforts in creating positive school environments are key to sustaining strong student achievement outcomes across all grade levels. Sessions may explore strategies for building strong staff buy-in and commitment to initiatives, creating and sustaining unified visions for student achievement, and the use of effective school climate measures. The focus of this strand is on summer, after-school, weekend, and evening programs. It also includes programs for youth who have been home-bound, suspended, or expelled and may include aspects of credit recovery. Effective strategies and programs that deal with out-of-school time or transitions back to school will make up this strand. "I have been coming to this conference for more than 20 years." "This is a group of like-minded and motivated professionals."